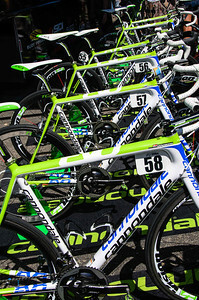 The team bikes all lined up before the stage 1 start. Yea, aren't we all...This vehicle travels with the tour each day. Each day's winner and random other riders are ushered in to be tested daily. 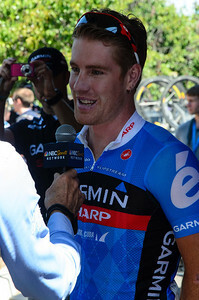 A relaxed and happy looking Tyler Farrar before stage 1. Tyler being interviewed by Bob Roll. 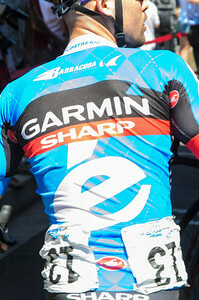 Caleb Fairly shows how some riders deal with being assigned number 13. This is to allow the bad luck to fall out before the race. Returning to the bus from rider sign in. 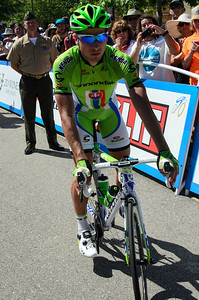 Peter Sagan rides through Sunday morning traffic to get to the start line in Escondido. It has now become a group ride to the start line. Bert Grabsch heading to the start line. 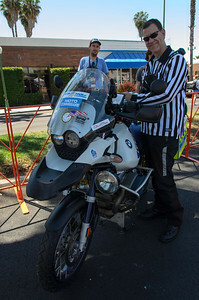 Race official preparing for a long day in the saddle. Ho hum, just waiting for the start in a nice shady spot. 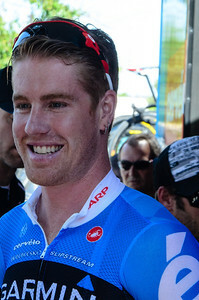 Tyler Farrar approaching the start line. While we both wait for the start, Tyler tells me his training has gone well and he feels good. 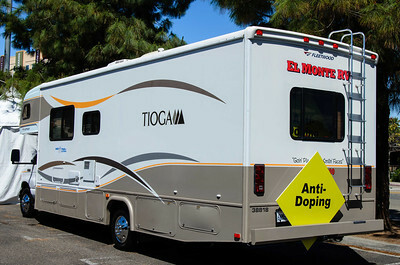 Hopes to give Sagan a run for his money this year. 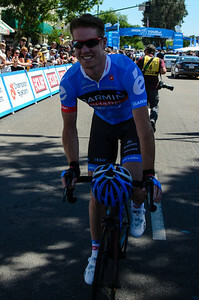 Turns out he does by winning the sprint on Stage 4 into Santa Barbara. 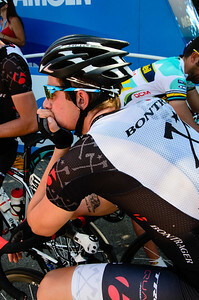 Boys waiting to start. 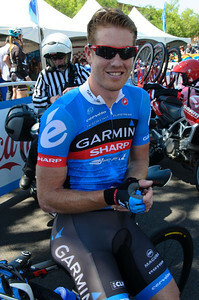 Garmin rider is Johan Van Summeren, Saxo rider is Timmy Duggan. 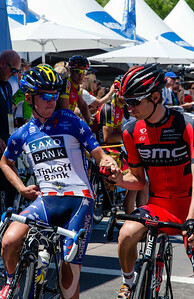 Timmy Duggan and Tejay van Garderen (eventual race winner) share a greeting. 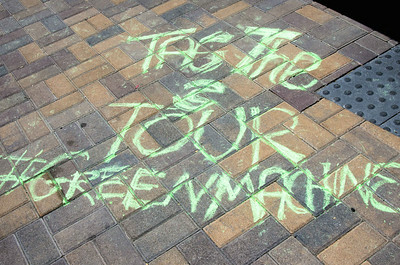 Peter Sagan (ultimate green jersey winner) on the line. Peter Sagan and world champion Philippe Gilbert share a greeting. 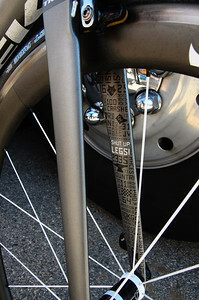 Sagan checking out what world champoin legs look like. 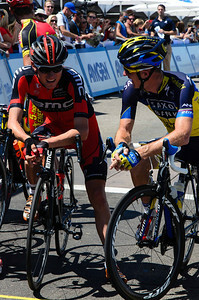 Tejay van Garderen shares a light moment with 2010 Tour of California winner Mick Rogers.Tejay and Mick would go on to finish one, two at the race's end. 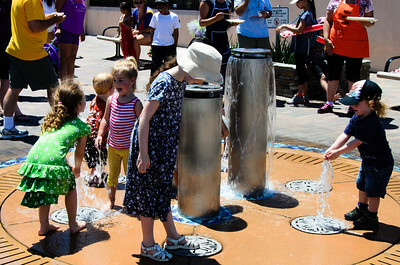 As temps approached 100 degrees in the Escondido morning, these kids had the right idea. 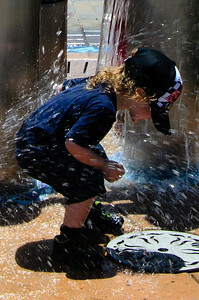 This looked so refreshing I almost jumped in with all the kids. 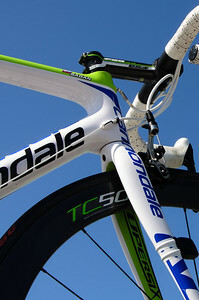 Spotted in front of the Cannondale booth. 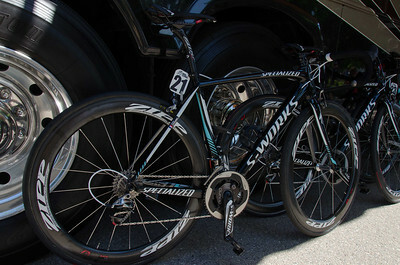 Sagan backup bike on top of the team car. Look close on the top tube and you will see his name. 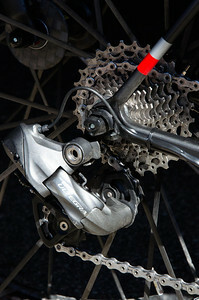 Gear cluster on Sagan backup bike. OK, this guy was the least friendly person I saw any day at the tour. I asked him what psi he was putting in the tires. I got a nasty look and a response that didn't sound like English. The look said, "who let you in here?". I was in a public access area. 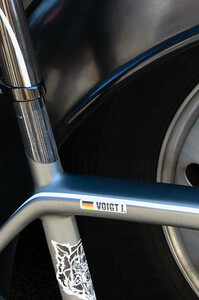 Jens Voigt race bike before stage 2 in Murietta. Jens' favorite expression is expressed here inside the fork. 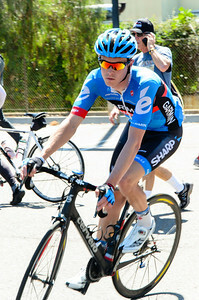 A few days later his legs would obey as he broke away from guys half his age to win on the finish into Avila Beach. 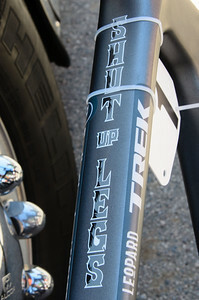 If Jens needs a reminder, it's on the top tube. 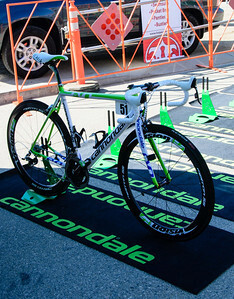 Syvain Chavanel's race bike on stage 2 start in Murietta. 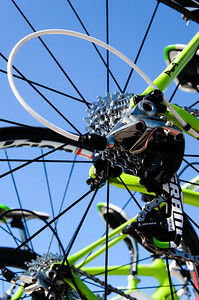 Looking at the Garmin bikes, one (Caleb Fairly) was fully equipped with Ultegra. 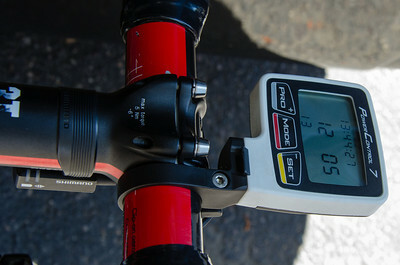 Upon asking, I was told that was just how the team chose to add back the weight they need to meet UCI minimum. If there ever was an endorsement for the quality of Ultegra this would have to be it. 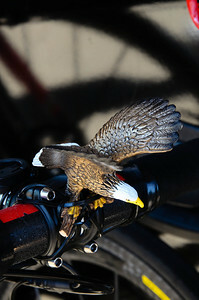 OK, I didn't get the story on who (it was team Garmin) or why somebody would be riding on the wings of eagles, but it looked pretty funny. Man I wish this day were over. 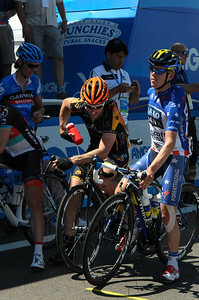 Team Vacansoleil waiting in the shade in Murietta, prepared to defend Lieuwe Westra's yellow jersey. 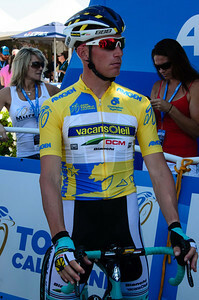 Race leader Lieuwe Westra awaits the stage 2 start in the shade in his nice yellow jersey. 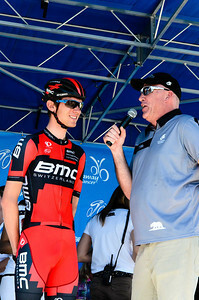 Tejay van Garderen being interviewed at the sign in before the start of stage 2 in Murietta. 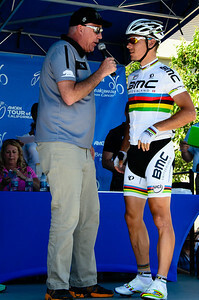 World Champion Philippe Gilbert interview at stage 2 sign in. It's tough being paparazzi. Philippe does not look happy. Whatever it is Philippe, I didn't do it. Honest! 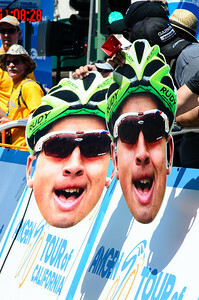 Peter Sagan...Hey, wait a minute. You guys can't start without me! Alright, somebody needs to let me in. Everybody seeking shade before the ride start in Murietta. 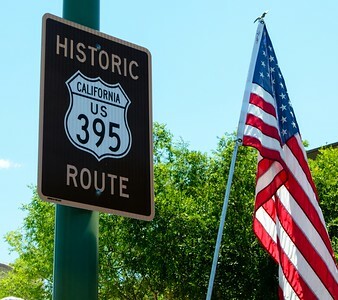 It was already hot but temps would later hit 111 into Palm Springs.